How do we come to be who we are? Lives are built day by day, but they hinge on memorable, transformational details—a mentor, a discovery, a dream or a gut check. Many factors shape us, but only a few we recall that define us. We asked several noteworthy people to reflect on what steered them to their life’s path. Their answers, fascinating and enlightening, are condensed here. 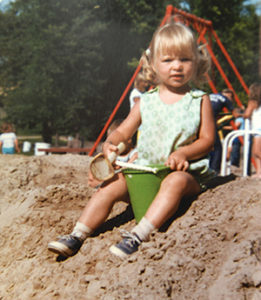 Sand eventually gave way to rich topsoil as the favored playground of Stephanie Jutila, now president and CEO of the Greater Des Moines Botanical Garden. “What I do now goes back to the boundaries of that sandbox: It was a blank canvas and I could create,” she says. Jutila grew up in Cloquet, Minnesota—“the home of Frank Lloyd Wright’s one and only gas station.” For as long as she can remember, she’s been interested in plant life, a passion fostered in childhood on her family’s 21 acres of land. I remember being outside from a very young age. Our land felt safe because it was a big piece of property, yet we knew where the house was. We grew raspberries, strawberries, tomatoes, peppers and cucumbers as well as hostas and daffodils. I tried to do everything with plants; I knew that they brought me a lot of joy. I had a brother who was five years younger, and a lot started to happen in our sandbox. I used his Tonka trucks—combined with things I would discover in the woods, like moss—to help me shape formations in the sandbox. What I do now goes back to the boundaries of that sandbox: It was a blank canvas and I could create. I had a fascination with things that would reflect nature and be inspired by nature. I worked in a greenhouse until I went to the University of Minnesota. I spent time with a landscape architect in Minneapolis. I was intrigued by the notion that I could work on a garden—I might be there for a week, but after that I would leave. I decided that working on temporary projects wasn’t enough; I needed to work on landscape projects that I could stay with for a long time and that require patience and perseverance. 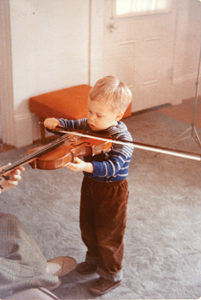 A wee version of future concertmaster Jonathan Sturm, whose career dreams at this stage may have been limited to reaching the fingerboard of a violin. I have kept to that work ethic pretty much ever since, auditions or not. Concerts, lectures, speeches, I try to be on top of every moment of my life. That has paid a better dividend than my talent, I am sure, and it is a message I send to all young people. A physician shortage brought Shah, a native of India, to Mount Ayr, Iowa, in 1994. He moved to Des Moines in 1997 and has specialized in geriatric and memory care as well as global health. I grew up with extended family in Mumbai. That means that my grandparents, parents, siblings, uncle and his wife, unmarried aunt—we were all under the same roof. Taking care of elders was important. We didn’t have a physician in our family; it was both the family need and the social respect that led me into medicine. In Mumbai, if you get good grades, you can get into medical school. There was a lot of respect in India for physicians and teachers. So I became a doctor. Like many people in the same situation, although I was in the upper-middle class, I left India to come to the United States. If I hear about a good opportunity, I just do it. Although Lauridsen’s artistic talents were clearly evident when she was a child—she played the violin and French horn as well as sang and acted onstage—she was also a stellar student in math and science. So at first she set her sights on engineering. I went to Northwestern University for biomedical engineering but quickly realized it was not for me. I was bored. I transferred to theater and realized that that was not for me, either; it was too experimental. So, I went into voice. I wanted to be Julie Andrews—to sing in musicals—but my teachers kept pushing me to opera. I naturally have a really big voice. It’s nothing I did; it’s what God gave me. I auditioned for the Chicago Symphony Chorus, which was a big deal. I started in an unpaid position as a second alto but then was offered a paid soprano chorus position. To sing as a soloist with the Chicago Symphony when I was 21—I think at that moment, I realized that I could have a career as a singer. At that moment, there was nothing I loved more; I sang with a joy from my heart. Before going into the salon business, Wong worked in the finance industry in Chicago. Her father, a first-generation American and self-made businessman, and mother “felt that I had arrived; that was the dream they had for me.” But Wong soon discovered that their dream wasn’t her dream. I knew right away that in corporate America, even though it was a well-paying, great job, I was missing something that filled my heart. I really wanted to be an entrepreneur, but I didn’t know what to do. I needed a passion. I was yearning for that opportunity to create a concept from zero to 100. One day, I went out to lunch with friends from the office, and the whole time, we talked about blow-drying hair. So I enrolled in the Aveda Institute in Chicago and moved from my Lincoln Park apartment with a rooftop deck into a 325-square-foot studio. My bed touched my dining table, which also touched my dresser. I went to school during the day and bartended at night to make ends meet. I wanted to save every single penny I was making to invest in opening my own salon. Parrish grew up in Camden, Alabama, where he attended segregated schools prior to the Civil Rights Act of 1964. Good teachers and his Presbyterian minister served as positive role models during his youth, he says. His teachers “pushed us to do our homework and they all took an interest in the fact that if we didn’t do well, they would care,” he recalls. “I didn’t want to disappoint them by failing.” Likewise, his minister “helped me by helping me read a lot. 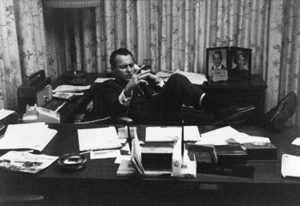 He loved to read and I had a knack for wanting to read, and it was a pivotal point for influencing me.” His parents, though, provided the strongest influence. They were teachers at Camden Academy, where I went to school. It was a mission school, funded by the Presbyterian Church in the North. Eventually, the states took the schools over, and that’s when they could begin to control the teachers and the activities they were involved in. My parents wanted to make things better for minorities in the South. People respected them in the community and listened to things they had to say. Both of my parents got fired from their teaching jobs in 1966-67. My mom taught second grade, and she was fired for organizing a student protest against segregation. My father taught science in the fifth grade and he was an elementary school principal. He got fired for running for the Board of Supervisors in his county as a black man. Even though they were treated unfairly, they respected people as human beings. Watching how they interacted with people was always a good marker for me. After they were fired, my mom went to New York to become a housekeeper to make a living. My dad did whatever he could to make a living. At the time, I was in my junior year at the University of Dubuque—I was a pre-med major. I love kids; I always wanted to be a pediatrician. I always thought that being a doctor would be a good profession. But when my parents got fired, I switched majors and decided I wanted to go to law school. I wanted to help people who have been treated unfairly. The grandson of an evangelical minister, Espe was raised in Radcliffe, 60 miles north of Des Moines. He enlisted in the Army, served in Vietnam and returned in 1970 “disillusioned and angry,” he says. His best friend, farm activist Dixon Terry, gave him a book on Zen Buddhism. “It spoke to me,” Espe says. 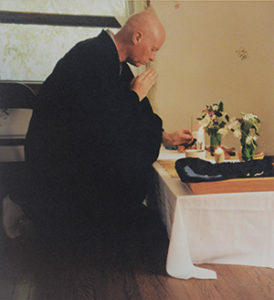 After a romantic breakup, he traveled to California to attend a monastery and learn about meditation, later returning to the Midwest to raise his family. Eventually, he became interested in becoming a Buddhist monk. In the late ‘80s, my friend Dixon Terry and I worked together on a farm in the Greenfield area. I thought I would never pursue being a monk because we were creating this farm. Then Dixon was tragically struck by lightning and killed. My interest in Buddhism is rooted in loss. I wouldn’t be a monk today if not for the losses of an early romantic relationship and my friend Dixon, the most brilliant person I have ever known. I was ordained in 1999, and Buddhism has helped me understand that loss is inevitable. The idea of impermanence is important in Buddhism. Part of the center of our practice is meditation, which is not an escape but sitting down in the middle of your life as it is and being there with it. You begin to understand that your thoughts are not permanent; they change. To sit down and just look at your mind is hard. It’s really peeling away at a lot of emotions and trauma and peeling away a lifetime of loss and regrets. When I went to Marquette University, I didn’t know what I was going to do. I would never have gotten into the television business had it not been for Bob Nenno, a reporter from the local NBC affiliate who taught a TV reporting class the last semester of my senior year. I was about to graduate without a resume tape, which you need to get a job. But he forced us to do a story every week. At the end of that semester, which was at the end of my college career, I was able to select three of the least-worst stories for my resume tape. I am eternally grateful. If he had not taught that class, there is no way I would have gotten a job. 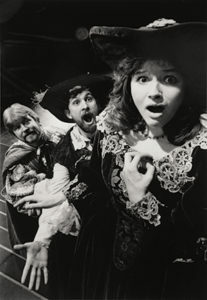 Berry’s first role was the lead character in a kindergarten play. At 12, he was cast in “Jabberwock” at Des Moines Community Playhouse. Performances followed at Roosevelt High School. But when he enrolled at Drake, where his father was a professor, he studied political science and law. Halfway through law school, I knew I didn’t want to practice law. Drake was doing “Hair,” and I thought, “I’m going to go try out.” I figured I wasn’t going to study for the bar, so I thought, “Why not study lines instead?” I played Berger, one of the two male leads. I had never acted at Drake during undergrad, and I waited until my third year of law school to do a show there. And thankfully, great roles came around. 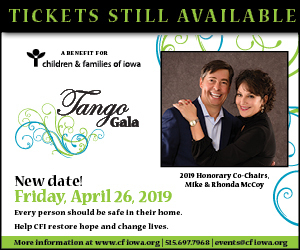 That same year, 1986, was John Viars’ first year at the Des Moines Playhouse, and I auditioned for “West Side Story.” He liked my voice and took a chance on me. After that, it was a string of shows. 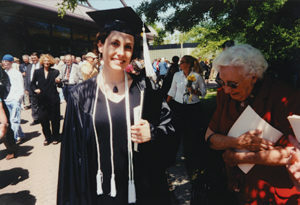 Dornink grew up in the clothing business: “My mom did custom dress design out of our house and would have little sewing classes for my friends and me when I was in third grade.” Although she “was surrounded by design and was good at it,” she wanted to be a surgeon and enrolled at the University of Iowa. One day during a math class, I was sketching dresses instead of taking notes. In that moment, it hit me: “I don’t want to go to medical school; I want to go to fashion school.” So after graduating with a degree in biomathematics, I applied to Parsons School of Design in New York and got in. But when I got to New York and understood how much Parsons would cost, I un-enrolled and temped at American Baby magazine. Through that job, I applied for a real job—my first was as a production manager for accessories designer Elizabeth Gillett. I just always assumed I would stay in New York City. But, I moved to Des Moines. It was a combination of having a business with my mom and the energy of having two designers at the same place. And, I started dating a boy who was from Des Moines. The two were a big enough draw to return here. In 1980, Cleverley was a national credit supervisor in Chicago and started going to farmers markets. In 1981 he transferred to New York City and was on the young executive fast track. But his interest in food called to him, from the family cooks of his Iowa childhood to New York’s huge Union Square farmers market. In 1995, I visited Des Moines’ Downtown Farmers’ Market and talked with Doug Smith, then the chef at Cosi Cucina. I asked him if a local farmer came in to sell him produce, would he be interested in it? And he really encouraged me to make the move and to do some of the things that I had seen, eaten and cooked in New York. In the fall of 1996, we packed up and moved to Iowa. I went to college to study journalism, but I was appallingly bad. As part of that major, I had to take a fiction class. I was always a big fiction reader and I loved to write, but I didn’t see myself as a fiction writer. I caught the bug. Part of it is that I received great feedback. Three teachers in particular told me I had a gift to write. It wasn’t until halfway through college that I realized how important it was to have a voice and to be a storyteller. I dedicated myself to books. I became a bookseller—anything I could do with books. I decided to get an MFA in fiction, and they taught me how to publish short stories, which is still a daunting thing. The acceptance rate is so low. I knew that writing was a compulsion and not a hobby. One of Greater Des Moines’ most well-known and influential business leaders, real estate mogul Knapp grew up on a farm in southern Iowa, where he milked cows with his brother and father, but he knew he didn’t want to become a farmer. “You couldn’t control your life because you couldn’t control the weather and you couldn’t control the price” Knapp recalls “I wanted to do something where I had some control.” Leaving the farm life behind, he became a restaurateur. 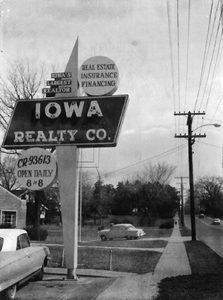 In 1947, my wife and I bought a restaurant in Allerton, Iowa. We called it the I and B Cafe (the “I” came from my wife’s name, Irene, and the “B” from my name, Bill). For a few months, we served breakfast, lunch and dinner. After a few months, we realized that it wasn’t what we wanted to do. It was too much work. The restaurant business is tough; anyone who can run a successful restaurant can run anything. We decided to sell the restaurant. I listed the company with W.K. Brewer, a business broker in Des Moines. In a few weeks, he said he had a potential buyer. He was busy and asked me if I would meet the potential buyer at the restaurant and show it to him. I took him down to Allerton and he bought the restaurant. I made the sale and the broker got the commission. As I thought on it later, I decided real estate might not be a bad way to make a living. His mother gave him a sketchbook when Gardner was just 2 years old, and he grew up fascinated by art. He went to Millikan University in Decatur, Illinois, to study graphic design, but found it too restrictive. After dabbling with philosophy and English majors, he met his mentor and found his place in the art department. There was a good community of artists and art students there. It encouraged me to spend my extra time in the studio, and when I graduated, I decided to be a professional artist, if I could. I tried to submit five applications a week to galleries and juried shows. I had a few exhibitions and was able to sell a few paintings. It was in graduate school when I was sure I was going to be a studio artist and that I was going to do art.